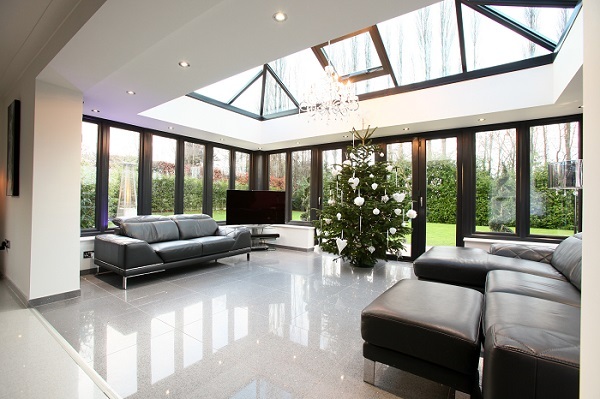 An Orangery differs from a Conservatory with its unique roof structure. Comprising of a Deep Box Section Outer Perimeter and Glazed Central Atrium. Abbey Glass & Burton Glass can design and build your dream Orangery in a wide choice of finishes in PVCu, Aluminium or Hardwood. Our Orangery roofing system can be fitted to a conventional Conservatory base and frames and can also be retro-fitted to upgrade an existing Conservatory. More substantial base and brickwork options are available, from Brick Pillars to Cut Block Stone Quoins. The Plastered internal roof Box Sections offer great scope for finishing touches, such as down lighters and other fixtures & fittings. An Abbey Glass & Burton Glass designed Orangery is a spacious light-filled extension to your home. Bright throughout the day, making the most of the natural light being thrown in from above, and cosy or intimate at night to suit your mood. With slender lines, plentiful windows and a large glazed atrium to open up the roof space to the skies, an Orangery allows light to flood in from outdoors, illuminating its own space and the room it adjoins. Whether you prefer PVCu, Hardwood or Aluminium in a variety of colours to suit your aspirations we can accomodate your dreams. View our Orangeries Glazing Gallery and also our Conservatory Glazing Gallery today. An Orangery is a versatile and flexible space that lets you get the maximum use whatever the season. Lounge, Home Office, Breakfast Room, a place for morning coffee with the papers or an after dinner night-cap, our Orangeries soon becomes the most popular room in the house. I am very happy with the work that has been carried out by yourselves. The window and door frames, glazing and blinds are of a very high standard, as is the finish of the installations and the brickwork. The workmen were tidy and very punctual and efficient, and your sales team were not pushy in the slightest, which I found to be a pleasant surprise. overall, a good experience from start to finish. A massive thank you to everyone that was involved in making our Garden Room a pleasure to sit in and enjoy. Everyone from start to finish was reliable and extremely professional in everything they worked on. Request a free consultation & start planning your dream project today! Sign up to mailing list? Copyright © 2019 Abbey Glass.